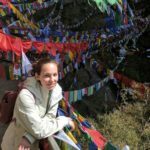 Great places to drink and dance along the South Carolina and Georgia coasts. My perhaps unconventional foodie recommendation is to save all your money for local oysters and farm-to-table or dock-to-dish eats at Charleston’s The Ordinary, Bluffton’s Farm and Savannah’s The Grey and then live it up by closing it down at these five unassuming dives. They’re all we want in a dive bar: No-frills, come-as-you-are places fit for cheap cold drinks, chatting up the locals, and swaying to the music. In the shadow of Savannah’s Desoto hotel look for the white plastic Pabst Blue Ribbon sign glowing like a beacon against the mossy oak canopy on Drayton Street. 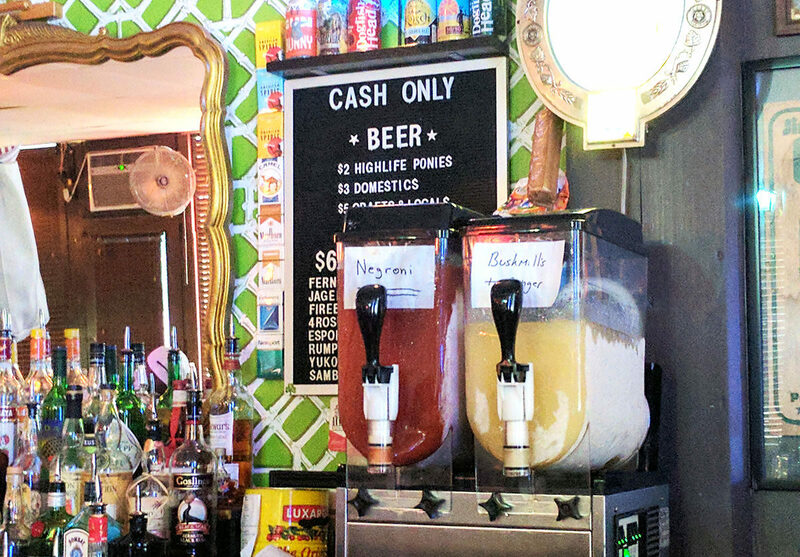 Named for its first proprietor Luis Christopher Masterpolis, who opened up shop in the 1950s, The Original Pinkie Masters is an authentic Dixiecrat dive, just as rich with history as it is with frozen negronis in the daiquiri machine: President Jimmy Carter famously stood upon the bar and rallied his constituency (there’s a wine-stained plaque to commemorate it). A confederate flag once hung over the bar (it’s now boxed on the wall, a relic of a past South). Bedecked with news clippings and pin-up girls, photos of epic Savannah St. Patrick’s Day parades past, and a culturally obsolete, racially intense, vintage Levy’s bread poster, it’s a veritable “Drunk History” museum of Savannah’s complicated past. 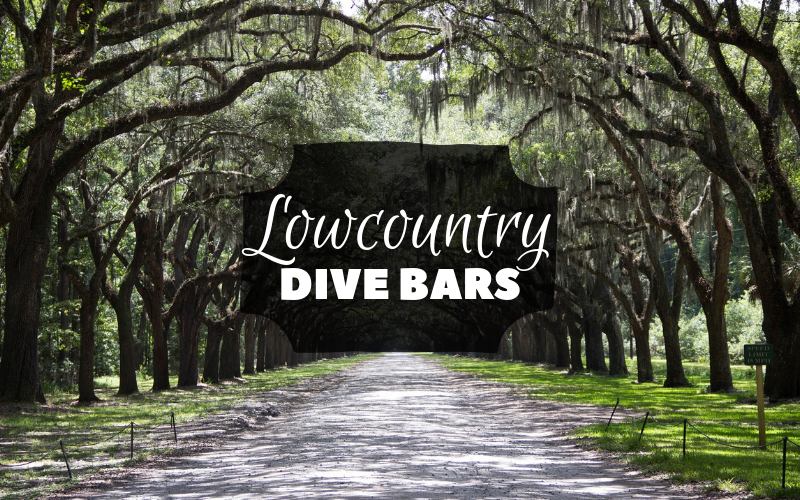 Southern Living calls this dive “one of the best in The South” and Savannah has no bone to pick with that. Plan A Trip: Pinkie’s is cash only. There’s an ATM on site. Save some dollars for the jukebox. More To Do: In Savannah, pedestrians can take their drinks to go—12-ounces or less, plastic only, in historic downtown between Jones Street and the river. If the bar’s too packed or it’s too nice out to stay indoors, grab a go-cup at the Pinkie’s counter and stroll the squares. Don’t abuse the privilege. Slow-moving “Tybee time” is this Georgia barrier island’s modus operandi. 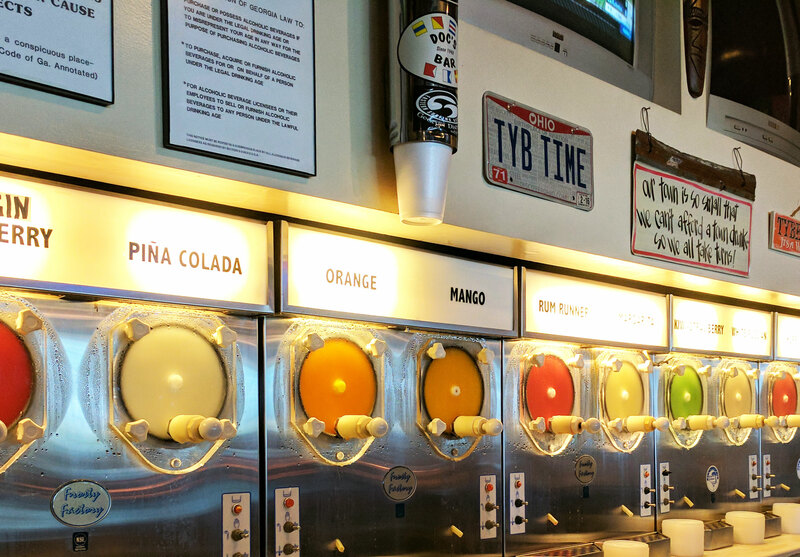 Its namesake sports bar/dive bar/daiquiri bar, Tybee Time, operates on the same central principle: Just chill. The days of smoking cigarettes in bars somehow don’t feel as much like ancient history here. Sandy-footed patrons sun-dazed from the beach come in to fuel up or watch a game on one of 13 big TV screens, or be put under a spell by the mesmerizing churn and slosh of neon rainbow of frozen drinks in ten separate stainless steel daiquiri bar dispensers along the back wall, sporting flavors like Kiwi-Strawberry, Rum Runner, White Russian and Mango. Plan A Trip: From Savannah, spare yourself the plight of parking and Uber over to Tybee for the day. More To Do: Grab your dream hangover breakfast at The Breakfast Club (open 7 a.m.to “about 1 p.m.” daily), hop a dolphin tour for some laid-back time out on the water, and of course, hit the beach. 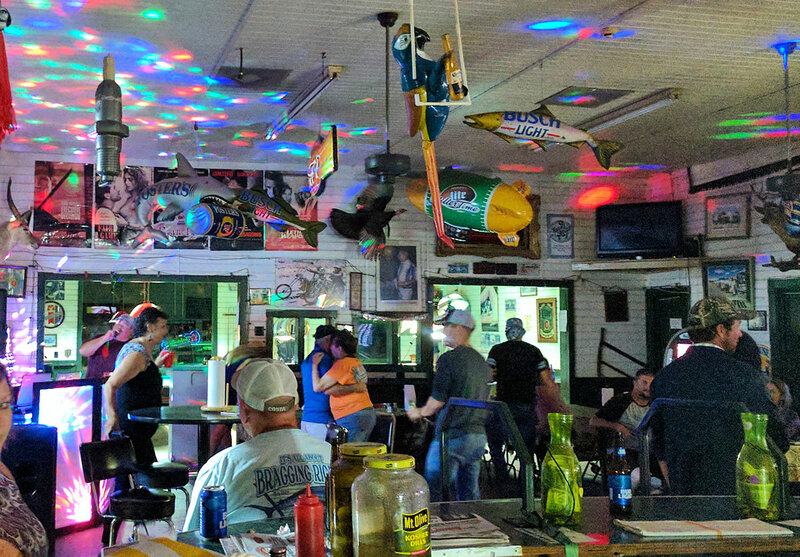 When passing through Yemassee, Harold’s Country Club just off Highways 17 A & 21 is the place to hang around for an authentic Lowcountry night. Harold’s is a family-owned gas station-turned-juke joint where karaoke is the official language. Sidle up to the horseshoe bar with the locals for a $2.50 can or three of Bud Light. The room—formerly the car repair garage—has ample space for two-stepping despite a few vinyl-covered lunch tables and the long row of Coca-Cola coolers full of soft drinks glowing against the wall. If you’re hungry for more than a snack-sized bag of chips, step through the bar into the back where you’ll find a proper roadside steakhouse. Plan A Trip: Harold’s is open Thursday through Saturday. Nominate a designated driver. More To Do: Conveniently, Harold’s also still sells fishing bait. Stock up and go jump in a creek. If you don’t have a whole afternoon, take a few minutes to stroll the nearby Sheldon Ruins. “A nice place to be if you can find it,” Hemingway’s on Henry C. Chambers Waterfront Park in Beaufort has outdoor tables, free Wi-Fi, a “gourmet lunch,” and dollar Jello shots. Hundreds of dollar bills from past patrons line the ceiling, Bloody Marys come topped with caviar and dill or strips of bacon as you like, and the proprietors do their darnedest to stay open even during hurricanes. Noon or night, Hemingway’s leaves little for a drinker to desire. Plan A Trip: The entrance is off the park beside Panini’s on the Waterfront, tucked under an awning a few steps down from sidewalk level. More To Do: Stroll the Cypress Wetlands, visit the St. Helena Chapel of Ease ruins, tour the Kazoobie Kazoo Factory, shop unique boutiques, take a carriage ride around the city, and buy sweet treats at Chocolate Tree (loved by actor Tom Hanks!). If you’ve still got a few bucks in your pocket at the end of a Saturday night on Charleston’s vibrant dining scene, throw it at the $5 cover to get into Burns Alley and hear Harry Chronic, Jr. or similar rock Tom Petty covers and howl a blazing-high rendition of Blind Melon’s “Rain” that gets everyone involved. 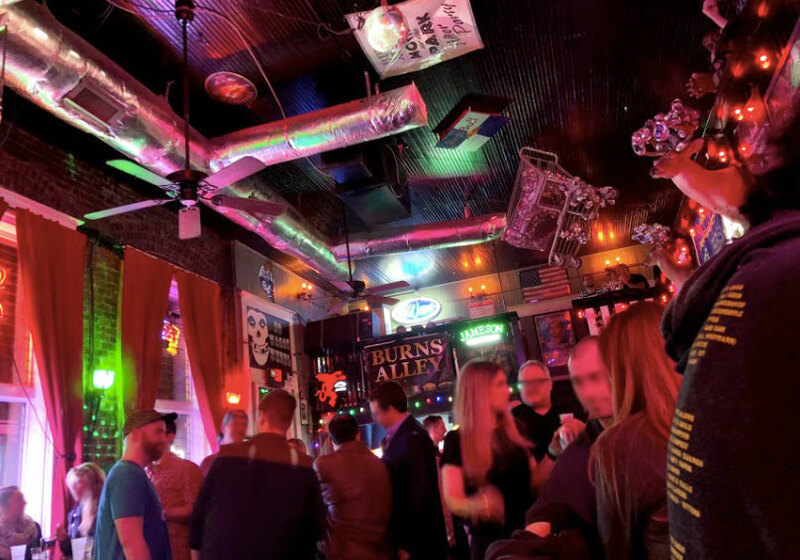 The drinks are nothing to write home about—which is true for any good dive bar—but a taxidermied buck’s antlers make a nest of crushed PBR cans, and someone brought a fog machine. If you can’t make it Saturday, Wednesday night features karaoke, Thursday night has live music, and Sunday night offers seven-dollar peanut butter and jelly sandwiches. Plan A Trip: Drop some Hilton points at the Embassy Suites in the former Citadel—it’s a pink castle with turrets and everything, and from Burns Alley, bed is a mercifully short crawl across the green. More To Do: Ogle the antebellum architecture, eat local oysters, and cruise out to Fort Sumter where the Civil War’s first shots were fired. 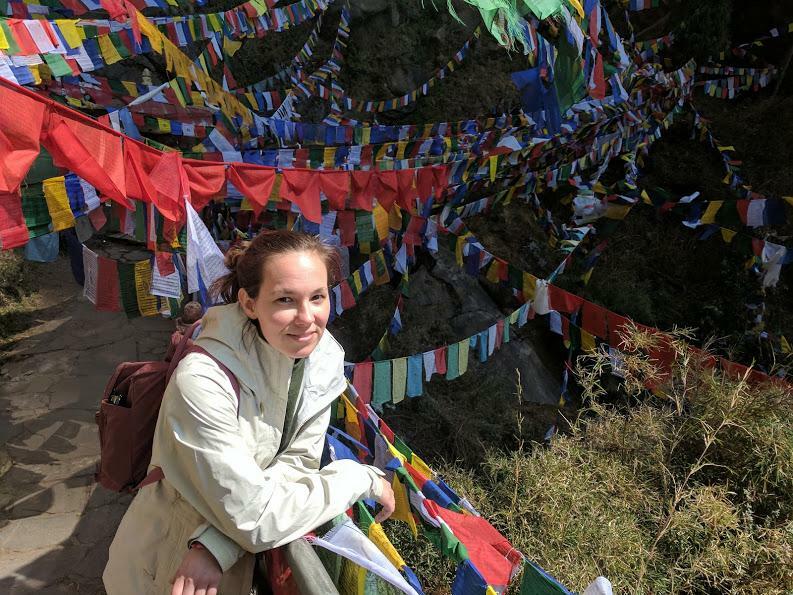 Alexandra Marvar’s travel and food writing has appeared in CNN Travel, The Washington Post, Stranger’s Guide, Bitter Southerner, Suitcase and others.